I went to the grand opening ceremony for the Petersen Automotive Museum‘s new electric motorcycle exhibit. It’s the first of its kind, and it was guest curated by Paul D’Orleans, presented by Bonnier and Harley-Davidson. Some of H-D’s new electric bikes, from scooters and light off-roaders to the eagerly anticipated Livewire were on display there, as well as prototypes from companies like Zero, who displayed their concept FX Supermoto. There were some truly out-there designs, like Curtiss Motorcycles Zeus. Electric motorcycles are poised to explode. The bikes are coming, and there are as many small e-moto companies now than there were motorcycle companies in the early 1900s. Zero Motorcycles has been in the space for over a dozen years. I photographed their first bikes for advertising and PR, and had the pleasure and surprise of riding one back then, as well as a few of the truly impressive, modern versions. Most of the other major bike manufacturers have announced electric motorcycles, or they will, soon. Honda just announced an electric CR with plans to also bring out an electric sportbike. KTM has the Freeride E-XC, which I’ve ridden and it’s a blast! Electric motorcycles are fun to ride, silent, immense torque off the line, and very easy for beginners to ride, as there’s no clutch or gearing to learn. 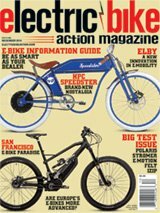 More to come in the next issue of Electric Bike Action magazine.